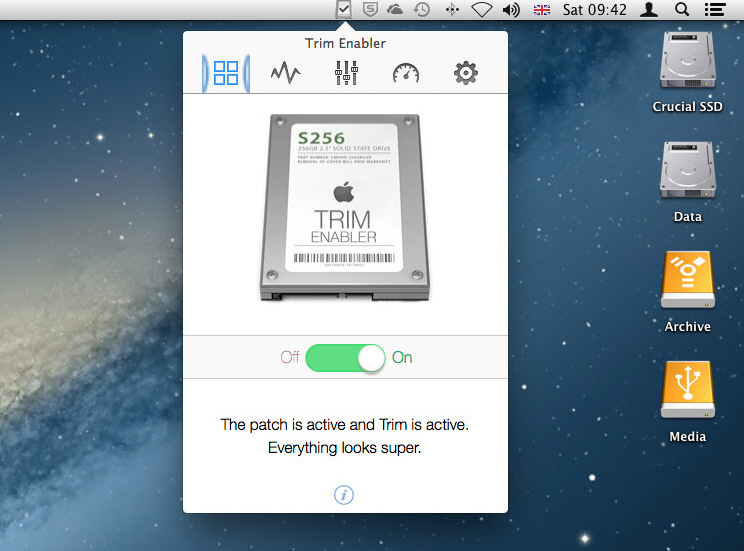 Oskar Groth has released Trim Enabler 3.0, his tool for enabling Trim on non-Apple SSD drives in OS X. The latest build continues to offer this core functionality, plus redesigns the user interface and adds some minor tweaks, for free, but also incorporates a new Pro version with extra functionality including benchmarking and advanced SMART monitor that can be unlocked for $10. The most notable change in version 3.0 is the redesigned user interface, which takes its design cues from the forthcoming iOS 7. The app also adds menu bar support, allowing it to be accessed directly from the menu bar or "torn off" and placed in a standalone window. The redesign sees Trim Enabler 3.0 split its various functions into five tabs: the basic status window where users can enable or disable Trim at will, a SMART status screen, Tweaks and Benchmarking sections (both Pro-only features), and Settings. Accessing the Settings tab reveals a new feature for all versions of the app, the ability to allow Trim Enabler to warn the user if the Trim patch has been disabled, which occurs every time OS X is updated. Users purchasing the Pro license for $10 can unlock three extra tools, the first of which is an advanced SMART monitor offering more detailed information and capable of warning the user if SMART indicates the drive is failing. Other Pro-only features include a selection of tweaks for freeing up drive space or saving battery life on portables -- some of which can be manually implemented by the user independently of Trim Enabler (specifically the disabling of Time Machine), along with a series of drive and filesystem benchmarks. Trim Enabler 3.0 is available now as a function-limited free download for Macs running OS X 10.7 or later. The Pro version can be unlocked from within this version.